Samsung announced the launching of several new phones in CommunicAsia conference in Singapore. One of the newly launched phones is the Samsung B6520 Omnia Pro 5. This device, along with its brother, Samsung Omnia 4, is the newest generation of Samsung smartphones. The target consumers for this phone are professional businessmen who do not much care about appearance but demand reliable smartphones with integrated business related applications. This phone is only available in black. The dimension for this handset is 116,5 mm x 61,8 x 11,5 mm. The screen is 2,4 inches TFT screen with 320 x 240 pixels resolution and supports up to 65k colors. For the navigation, this phone incorporates fully functional QWERTY keyboard. Standard functions for mobile phones such as SMS, MMS, clock, alarm, calculator, calendar, push email, and to-do list are fully supported. Users can choose preinstalled ringtones or use their own MP3 and WAV files as their ring tones. Vibration mode is also available in silent mode. This device provides almost unlimited entries for contacts in the phonebook section and call records. With Windows Mobile 6.5 as the operating system, users can access their emails, social networking sites, chat with instant messaging, play games, as well as enjoy videos and music. The video formats that are supported on the device are WMV, DivX, H. 263, and H. 264. The handset supports MP3, Poly 40, SP-Midi, SMAF, AAC, AAC+ and WMA formats. Stereo FM radio function is also available. Browser for this phone supports WAP 2.0, xHTML, and HTML. Aside from the Media Player, some pre-installed programs in this phone are Microsoft Outlook Mobile, Adobe Flash Lite, Voice Memo, T9, and Pocket Office which support Word, Excel, and PowerPoint files as well as a PDF viewer. Samsung B6520 Omnia Pro 5 has been certified by Sybase Afaria for secure access to business related applications. The resolution for the camera is quite low for the phone of its caliber, only around 2 MB or 1600x1200 pixels. However, this phone has some advanced features such as Face Detection, Geo Tagging, Smile Slot, and Sound Alive technologies to enrich user's experience. For the 2G networking, the phone supports GSM 900 / GSM 1800 / GSM 1900 / GSM 850 and for 3G networking, the phone supports HSDPA 1900 / HSDPA 2100 / HSDPA 900. Note that the availability of these networks depends on the user's location and service provider. For connectivity, the phone is equipped with Bluetooth and Wi-Fi. Users can also access the internet with GPRS or WAP, depending on the availability of the service. The internal memory for this phone is around 200 MB, so users are expected to add their own memory card on the card slot to be able to use all the applications in this phone to the fullest. The memory card slot supports micro SD card slot for up to 16 GB. Other features of this device are 3.5 mm audio jack, GPS with A-GPS support, and USB 2.0 Port on the chassis. The phone is powered with standard Li-Ion 1500 mAh battery. 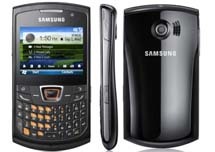 Samsung B6520 Omnia Pro 5 is planned to be launched in South East Asia, Africa, Middle East, India, and Latin America around August 2010. Launching date for other locations has not been disclosed. Samsung has not yet announced the price for this handheld device.